Strawberries are an excellent source of vitamins C and K as well as providing a good dose of fibre, folic acid, manganese and potassium. They also contain significant amounts of phytonutrients and flavanoids which makes strawberries bright red. 1. Cut pancakes in different shapes. 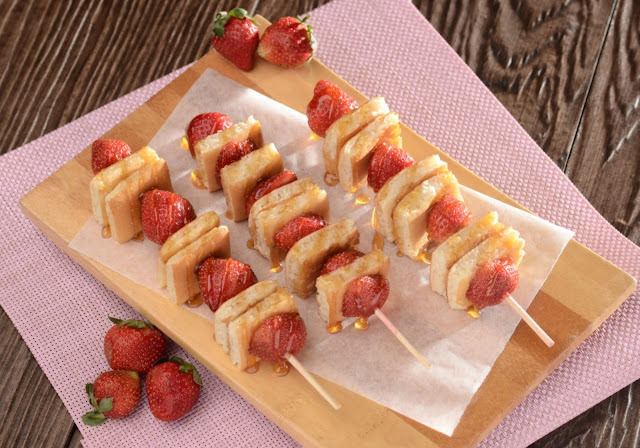 Skewer pancakes then strawberries in alternating order. 2. Arrange everything on a plate then drizzle with syrup. Serve.